Edgar Lungu has demoted MMD faction president Felix Mutati for messing up the IMF program. And Lungu has appointed Dora Siliya as information minister and main PF regime spokeperson. Michael Sata must be turning with pain in his grave. MMD die hard thug Bowman Lusambo is now Lusaka province minister. All these useless, unnecessary changes are an effort to divert public attention from Lungu’s endorsement of stealing. Lungu has appointed Commerce Minister Margaret Mwanakatwe as new Minister of Finance, replacing Felix Mutati who has been moved to the Ministry of Works and Supply in the same capacity. 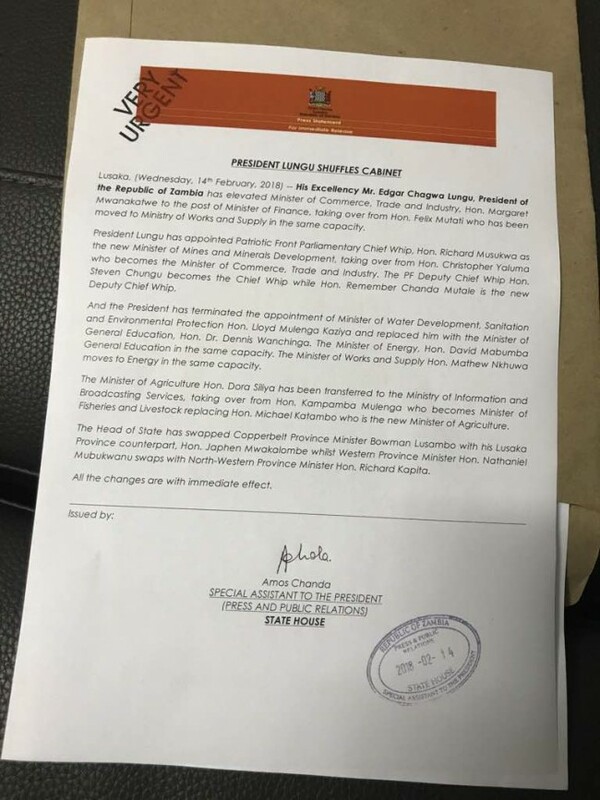 Meanwhile Lungu has fired Minister of Water Development Lloyd Kaziya who is linked to the opposition. and replaced him with Minister of General Education Dennis Wanchinga. Energy Minister David Mabumba becomes new Minister of General Education whilst Minister of Works and Supply Matthew Nkhuwa moves to the Ministry of Energy in the same capacity. Kampamba Mulenga who was chief government spokesperson has been taken to the Fisheries and Livestock ministry. Kampamba replaces Michael Katambo who is new Minister of Agriculture. Ane Lungu has swapped MMD die hard thug and Copperbelt Minister Bowman Lusambo with Lusaka Province counterpart Japhen Mwakalombe whilst Western Province Minister Nathaniel Mubukwanu swaps with North-Western Province Minister Richard Kapata.